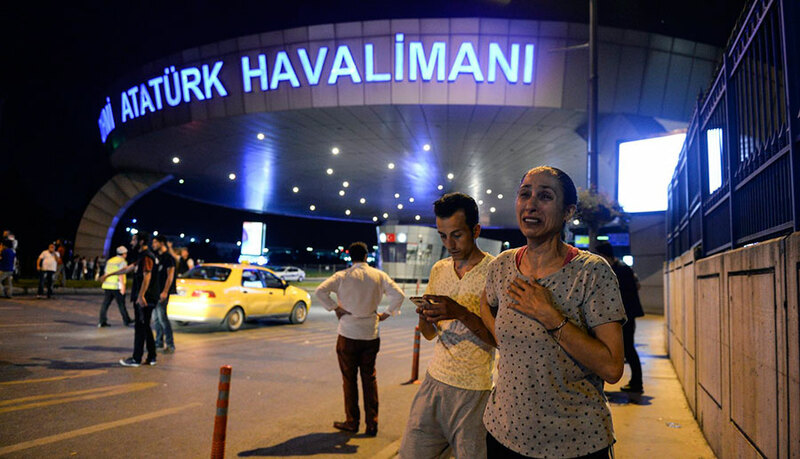 Three unknown men armed with automatic guns irrupted the Istanbul Ataturk Airport last Tuesday at around 10 p.m. With deadly intent, the men started shooting at people where passengers usually hail a cab making their way into the building. Once inside, all the reports and stories indicate that they shot as many people as they could before blowing themselves up. The carefully planned attack resulted in 41 fatal victims including 13 foreigners from different countries and injured more than 200 people. Ataturk is the biggest international airport in the city. Since it connects Europe and Asia, it is always crowded with passengers. Last year, the authorities estimated that the terminal served around 60 million passengers which makes it the third busiest airport in Europe. Consequently, the location is the perfect objective for the wave of terrorist attacks that are taking place in the region. Some of the experts are comparing it to the Brussels attack, but in the Ataturk, there were more deaths and injured people. In spite of all the apparent evidence, no terrorist organization has taken credit for the attack, but the authorities suspect ISIS. Despite the fact that the Kurdish Militia has been the protagonist of many violent events in the country, they usually hit governmental buildings. The gunshot assault followed by suicide bombings is one of ISIL’s preferred modus operandi. Much of the information comes directly from testimonies. There was a lot of people in the terminal at the time of the attacks, and they say there were glass and blood everywhere. The attack started at the entrance of the terminal where people usually take taxis. The three men opened fire with what some witnesses said were Kalashnikov rifles. Also known as AK-47, the weapon is a gas operated assault rifle capable of massive amounts of destruction which explain why the people said the floor was slippery because of all the glass and blood. According to an African marriage that managed to survive the events, the men were wearing black clothes. They said that besides the automatic weapons, they also branded handguns and were shooting anyone at their sight. Then, a moment of silent was followed by the sound of an explosion. According to official reports, it was a three men suicide squad. They shot until running out of ammo or getting in position, whatever happened first, and then, detonated bombs killing themselves in the process. A security video shows one of the attackers being shot by an officer. Then, about 20 seconds later, an explosion takes place where the man was lying down. Due to the quality of the video, it is not clear if it was a police officer or part of the Airport’s security. Moreover, officials have not confirmed if the attackers used detonators or if they used timers to make the bombs exploded regardless of the situation. The Governor of the city confirmed that almost half of the people injured were released from the hospitals with minor wounds. The Istanbul Ataturk Airport resumed operations around 8:00 a.m. It is expected that similar terminals around the world take special precautions after these events, especially in Europe. In fact, Twitter users report that the airports in New York are on higher alert.